Ballpark Basics: A unique and historic ballpark whose days seemed to be numbered. 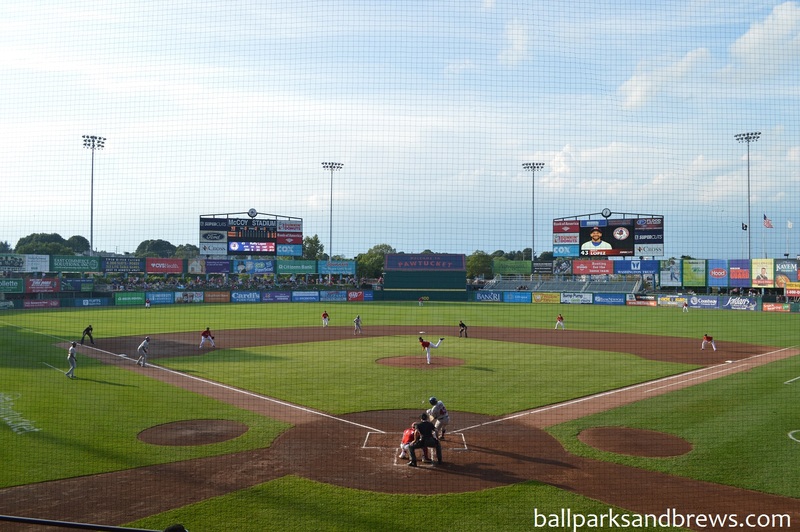 Ballpark Breakdown: McCoy Stadium is a throwback. You first notice this when driving to get to the ballpark. 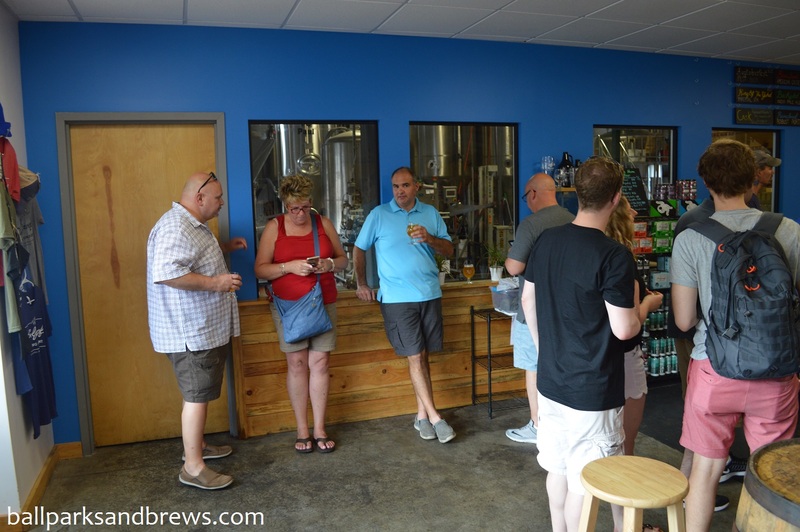 It is tucked away in a residential neighborhood with houses closest to the ballpark charging to park in their yards or makeshift parking lots. If you travel few blocks off you should have no trouble finding on-street parking for free. 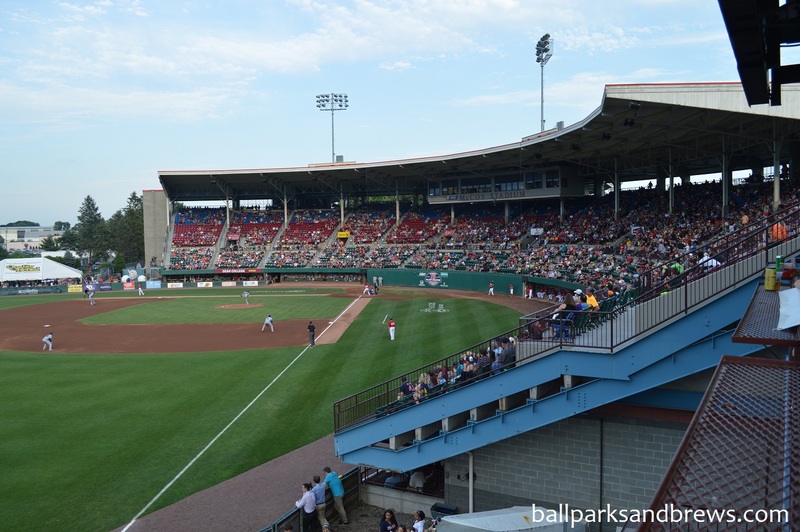 Once inside the stadium the shape of the grandstand is another aspect that makes this McCoy Stadium stand out. The dugouts are at ground level so the seats start out higher than a typical park and the height causes the grade of the seating bowl to be a little steeper than usual. The grandstand is a semi-circle which helps creates one of the largest foul territories in baseball. While many of the other ballparks in the Red Sox farm system mimic the dimensions of Fenway Park, McCoy Stadium does just the opposite. The team does a great job of incorporating the history of the ballpark and the team throughout. There are murals in the concourse, momentos in the gift shop commemorating special games that took place, and the team even has its own song that they play before the game (and it’s amazing!). With the parent organization a short trip away and a fan base as fervent as Red Sox Nation the PawSox games are a popular event. 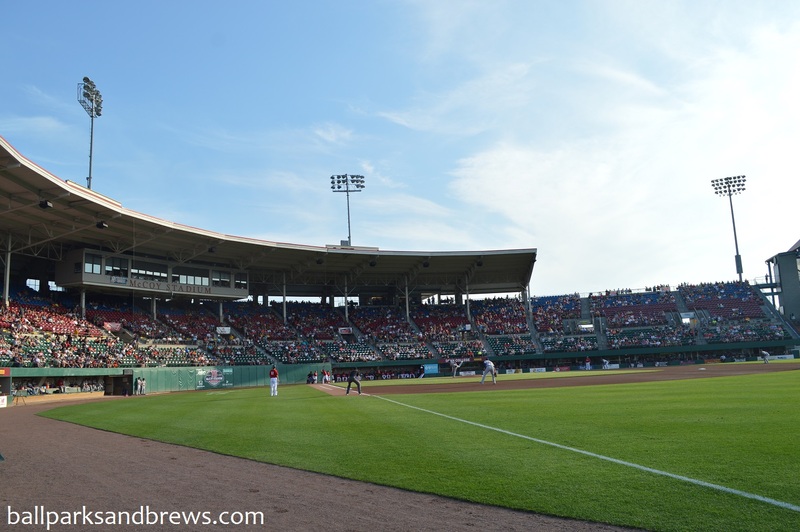 McCoy Stadium also does a good job of incorporating areas for groups to catch the game. There is berm seating behind the left field wall, as well as group areas behind the right field corner and down the right field line that can be rented out. The tower at the main entrance not only has the stairs for the upper concourse but also is a popular spot to stop and watch the game. Best Spot For Beer: There is no lack of food or drink options as you tour the park with concession stands and carts placed throughout. However, the best spot that we found for beer was a beer stand located in the left field corner dedicated to local craft beer (ironically located right next to the Budweiser Deck). It included options from Zeppelin Brewing Co., Grey Sail, Wachusett, and Foolproof Brewing Co. on our visit. The team has been looking to replace McCoy Stadium for a number of years and it looks like its days are numbered. If you find yourself in Boston for a Red Sox game do yourself a favor and drive the short drive down 95 to catch a game. Brew Basics: Further tying in the baseball theme, this one was a “can o’corn” brewery. 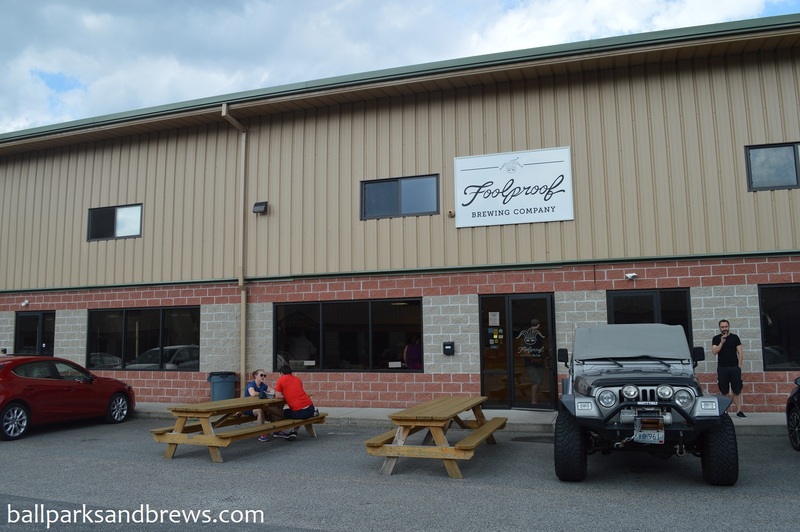 Dating back to January 2013, this building houses the brewery, an office and a main tasting room/lobby area. Despite their very limited hours (4-7 Thursday/Friday, 1-6pm Saturday and Sunday) the small place was packed, and we got one of the last possible spots. 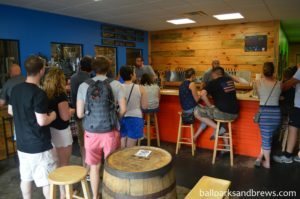 The room is done mostly in raw wood, with bright blue and red accents, a bar and a couple bourbon barrels provide a bit more flat surface area. A small umbrella ledge running around the side walls would be a great addition to the room, so that those who can’t grab a spot don’t have to just stand around the middle of the floor holding everything. Beer is available for to-go shoppers, and they usually have some kind of discount running if you buy in bulk. While shopping, Foolproof fans can also expand their beer memorabilia collection; for along with the typical t-shirts and pint glasses, there are also unique items like glass boots and hockey sweaters available for purchase. Brew Breakdown: The beers of Foolproof lean traditional German, so expect a lot of Bohemian/Bavarian malt profiles. Overall we enjoyed what we tried, but found a few to be more of a swing and a miss. La Ferme Urbaine (LFU) 7.8 ABV – La Ferme is a farmhouse ale that tastes strongly of wet yeast and banana. The bouquet is also somewhat off putting, giving off strong esters, but it has a slightly tangy taste that is better than it smells. Best to drink this one very cold. The Grotto IPA 6.5 ABV – Unfiltered, with a good, blended hop smell. The Grotto pours a light but bright yellow in color, with a pinch of haze and high carbonation. In the palate a punch of hops upfront gives way to a fresh cut grass aftertaste, and a hint of citrus that becomes more pronounced as it warms. Backyard IPA 6.0 ABV This yellowy brown beer has a bad combination of banana and bubblegum aromas and poured with lots of foam that took quite a long time to dissipate. It does taste better than it smells, dry and earthy upfront and a wheaty finish. 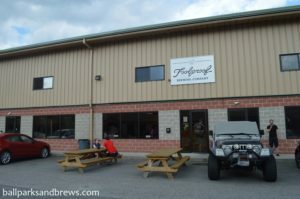 Augtoberfest 5.2 ABV – The most requested beer of the patrons who visited while we were there. This Festbier was specially brewed for their upcoming Augtoberfest, which had tickets available for $25 per. The beer itself is a bright, sunny golden color. The palate is dry, with a light pilsneresque quality, a salty, lightly hopped taste, and a traditional German style lemon-yeasty finish. Queen of the Yahd 5.2 ABV – A raspberry IPA that was orangey amber in color and smelled of caramel malts and sweet raspberry. Though the beer is actually somewhat tart, you get very little of the hops, as the addition of the significant raspberry seems to mellow or cut the IPA and make it more like a light marzen. Raincloud Robust Porter 6.5 ABV – This chocolate nut brown colored beer is summed up as dry, brown and oaty. Served chilled, there isn’t a lot of flavor upfront, but it does present a dry, roasted start. It’s more carbonated that a typical porter and that helps bring out nutty, roasted oat flavors mid sip. Finishes dry, and slightly burnt.